This is the documentation site for vnf, the Virtual Neutron Facility. The vnf service gives users an easy, integrated access to computing tools for end-to-end simulations of neutron scattering experiments. These include modern methods of simulating the structure and dynamics of the materials under study. This link will take you to the login page of the Virtual Neutron Facility. The Virtual Neutron Facility is a set of interoperable software packages that allow scientists to simulate neutron scattering experiments. Much like real experiments, vnf has two main parts: 1) instruments, which uses the subpackage MCViNE, and 2) samples, which uses the subpackages for scattering kernels based on modern methods from the theory of materials structure and dynamics. Many of these capabilities within vnf have been available for a number of years, and fortunately have been tested well. For example, Monte Carlo simulations of instruments are well established, as are plane wave pseudopotential codes for electronic structure calculations. There are a number of missing steps between these theory codes and a neutron instrument simulation that are provided by vnf, such as building a sample assembly containing different scatterers, simulating modern, complex detector system, or considering the effects beyond single excitations in inelastic scattering. The vnf packages provides these missing capabilities in a cohesive manner, and offers a natural work flow in setting up the simulated experiments. The essence of neutron scattering is shown in the diagram above, with a neutron interacting with the sample. The incident flux of neutrons is generated by MCViNE and the final neutron state is detected by MCViNE. The scattering law, S(Q,E), is provided by a scattering Kernel. 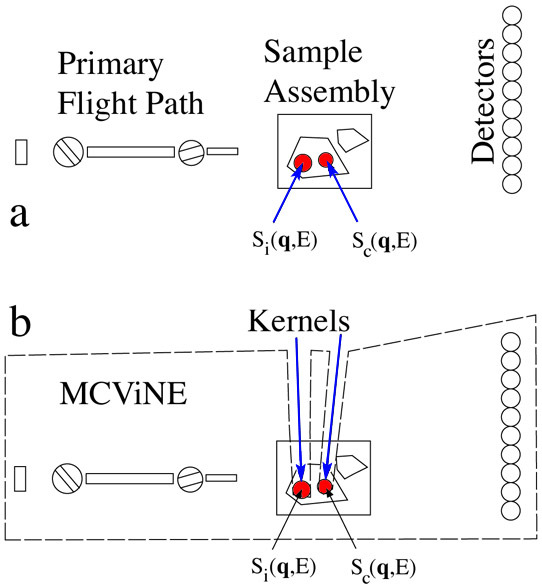 The software boundary between MCViNE and the Kernel is shown in the figure above, which depicts more details of a neutron instrument. Note that only a selected piece of the sample assembly is modeled by the scattering Kernel. Most of the sample assembly, such as the holder, aluminum can, and shape of chunks of material, and handling of multiple scattering, are parts of the Monte Carlo framework, MCViNE. 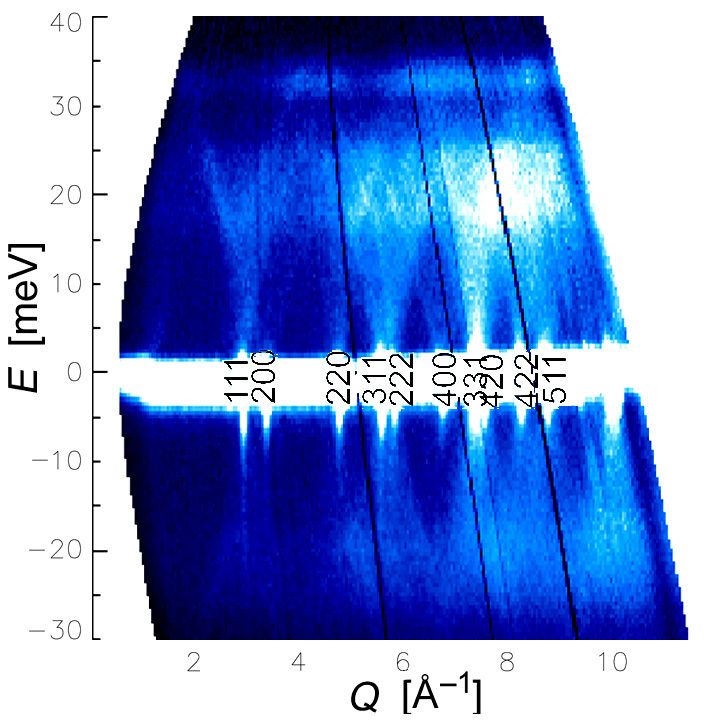 The interface between MCViNE and Kernel is through a data structure for the scattering function, S(Q,E), which can describe experimental results such as the S(Q,E) in the figure below, and could include multiphonon scattering if so desired. The sample structure utilizes an S(Q,E) obtained by simulation or modeling, and different S(Q,E) are provided by different modules for materials theory and simulation. The scattering component with underlying theory is termed the “scattering kernel.” The kernels can be as simple as quick functions to generate an arbitrary S(Q,E) – a constant background may be useful, for example. More sophisticated kernels implement physical models of scattering. These are described in several textbook references, and more advanced discussions as in http://drchops.caltech.edu:5001/click_monitor/ARCS-bigbook The more substantial scattering kernels make use of the developments in materials theory over the past decade in both modeling and simulation. Computationally it is important to distinguish between a model and a simulation. All models have parameters that can be optimized based on fitting to experimental data. These calculations are iterative, used to fit experimental data by optimization. On the other hand, ab-initio simulation have no adjustable parameters, and are forward computational chains. In the middle, however, are simulations such as molecular dynamics simulations, which have some ab-initio characteristics, but some parametric behavior. The simulations are based on Monte Carlo simulations of instruments, which can be configured by the user at runtime. Instrument components (some of them come from python bindings of McStas, for example) are assembled together to form an virtual instrument, and a simulation engine passes groups of neutrons through them. Datasets from the primary flight path (neutrons on sample) can be recorded, and used later for an experiment on a particular instrument with a specific incident energy and energy resolution. These pre-recorded neutron fluxes on sample can then be used for interaction with the sample to produce a scattered beam of neutrons to the detectors. Interface to the sample is through the scattering function, S(Q,E), which contains the scattering law as a function of momentum transfer, Q, and energy transfer, E.
© Copyright 2009-2010, Jiao Lin, Brandon Keith, Alex Dementsov, Nikolay Markovskiy, Xiaoli Tang, Mike McKerns, Michael Aivazis, Brent Fultz. Created using Sphinx 0.6.4.